Hydroxyethyl cellulose (known as HEC) is a white or light yellow, odorless, non-toxic fibrous or powdered nonionic, manufactured through etherification of alkali cellulose and ethylene oxide (or chlorohydrin). 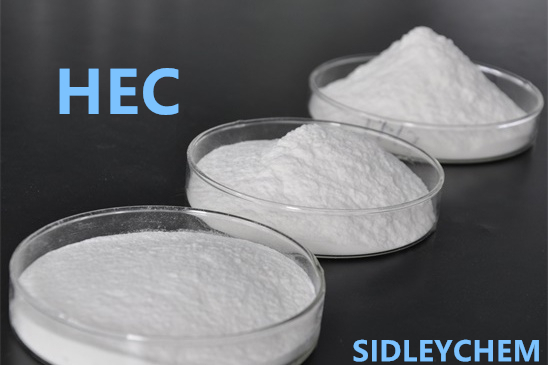 HEC is soluble in both cold and hot water, and has no gel characteristics. It has a wide range of substitution, solubility and viscosity, good heat stability (below 140 ° C), and no precipitation under acidic conditions. HEC solution can form transparent film. It has non-ionic characteristics which are not compatible with positive and negative ions and good compatibility. So it can be used as coating agent, binder, cement and gypsum auxiliary, thickener, suspending agent and medicine, excipients, antifogging agents, oil well fracturing fluids, drilling treatment agents, fiber and paper sizing agents, cosmetics, toothpaste, etc. It plays an important role in the development of the social economy and is one of the fastest growing cellulose ethers in recent years. After the end of HEC etherification, refining is required. The refining process includes neutralization, cross-linking, washing, filtration and drying. The neutralization agent is usually an organic acid such as one or more of acetic acid, propionic acid, and formic acid. 3. Because the molecular weight of the organic acid is large, the solubility of the formed sodium salt in the washing solvent is low, and the ash content of the product cannot be reduced to less than 5% after washing. So the moisture content of the material is high when enter dryer, which might needs wash and dry again. 4. After drying, the material is relatively hard and coarse due to twice washing and drying. During the pulverization process, the pulverization load is large, and the temperature at the top of the pulverizer reaches 80 °C and 120 °C, which reduces the pulverizing ability. In summary, the current use of organic acid as a neutralizing agent leads to complicated subsequent processing, high production cost, and low quality of the obtained hydroxyethyl cellulose refined product. 1. The appearance of the material after the neutralization is in the form of sand, suspended in the solvent after the etherification reaction, thus can be continuously washed by the drum type continuous filter press washing device. The materials are uniformly distributed on the filter net, washed under a certain pressure with an aqueous organic solvent, washing and separating simultaneously. Moreover, the washing pressure of each section is not high when washing, which is favorable for the flexibility of the filter press. 2. Inorganic acid is cheaper than organic acid, easier to buy from the market, and has a stable source and quality assurance. 3. After the inorganic acid neutralized material is washed, dried and pulverized, the appearance of the product has high whiteness and dispersibility, and the product stability is relatively good. In addition, the continuous production line greatly improves the production efficiency, reduces the labor intensity of workers, improves the intrinsic safety of the production line, and reduces the consumption of energy and raw materials.